Custom fields are the additional fields which are created for the tickets as per the requirements. In simple words, your visible custom fields appear on your support request form in the help center. It is used to gather more information about the support issues, product or any service. While creating a custom field, there is a field called Dependency. If we select it for the particular ticket type, then while creating another ticket if it has the same ticket type then that particular custom field will appear in the dialog box. On the Dashboard, you will see "SETTINGS" menu and under it, you will find "Custom Fields". Click on the "Custom Fields" Icon and then you will be redirected to a new page. On the new page, you will see Controls Panel which will contain various custom fields. You can drag and edit any Custom Field into the canvas. 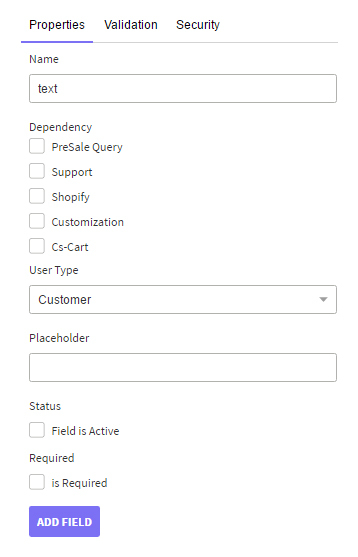 Under the "Properties" section, you can set Name, select Dependency, select User Type, select Status & Required. 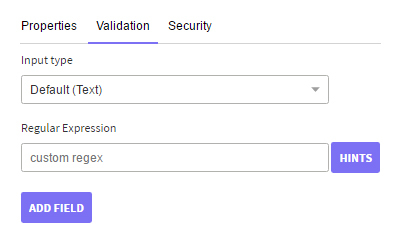 Under the "Validation" section, you can set Input type, Range, Allowed domains, Restricted domains & Regular Expression. Under the "Security" section, you can check the Encrypt Field. Whenever you create a custom field, you are provided with an option to make the field encrypted to secure the data entered by the user for the respective field. Whenever a user (agent/customer) views this data, an entry is made into a log identifying the request. Secure Field View Logs is a log of such requests, which can be used to identify who all have viewed a particular data.